Rooted in traditional forms of American music and dance—swing tunes & tap, hoedowns & clogging—the varied repertoire of RIS, directed by choreographer Sharon Leahy and composer Rick Good, was at once original and recognizable. From 1987 to 2010, this critically acclaimed body of work infused the spirit of traditional dance and music with a thoroughly modern sensibility. 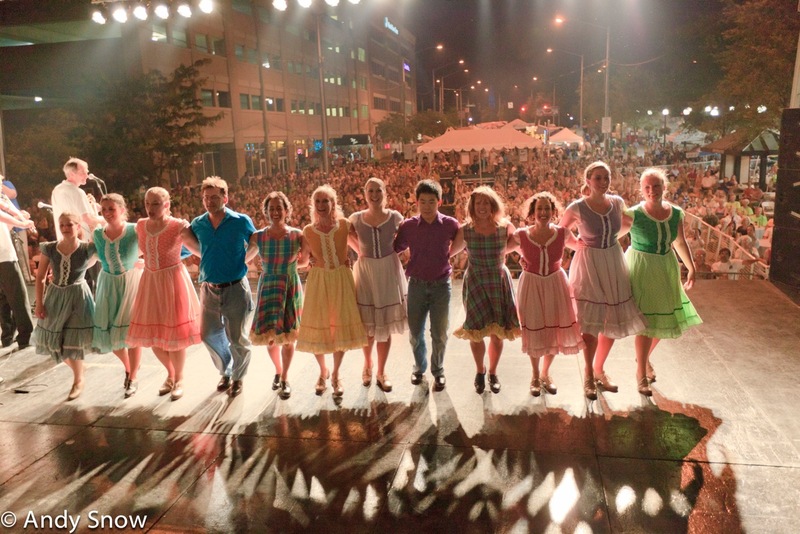 After 23 years of making music and dance rooted in American traditions, Rhythm in Shoes polished off the 2009-2010 Celebration Season by pulling out all stops at the Cityfolk Festival on the 4th of July, in downtown Dayton. 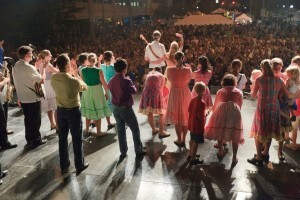 More than thirty performers, spanning the company’s long and fruitful history, were on hand for an unforgettable fireworks show for the feet. Video clips from the vast and varied repertoire of Rhythm in Shoes are now accessible on the LeahyGood YouTube channel, as well as this site’s VIDEO page. 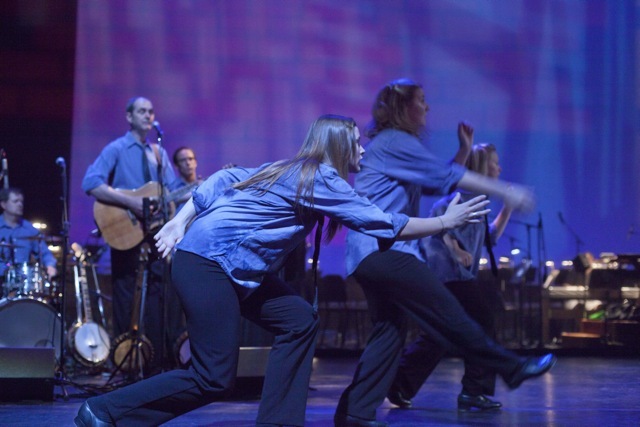 Based in Dayton, Ohio, the creative capitol of the Heartland, RIS toured in 48 states as well as Canada, Japan and Ireland, pursuing the company’s mission: to engage the world in music and dance. 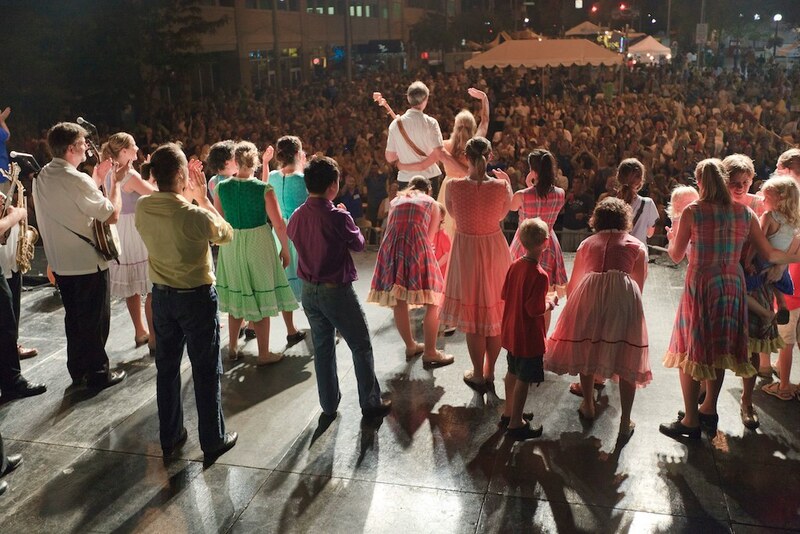 From the concert hall, to the cabaret, to the classroom, the creation of exciting and thought-provoking work was achieved by maintaining a strong company of musicians and dancers, and by collaborating with other, like-minded artists who were steeped in tradition and pushing their boundaries. Every Rhythm in Shoes performance was designed to be a seamless voyage of varied delights. 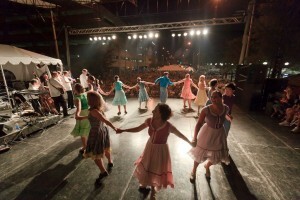 Featuring both traditional and original dance and music, drawn from the uniquely American forms of swing songs and tap, oldtime tunes and clogging; each show laced throughout with wit and wisdom. It was performance art, both original and familiar; a fresh fusion of music, dance and theater. 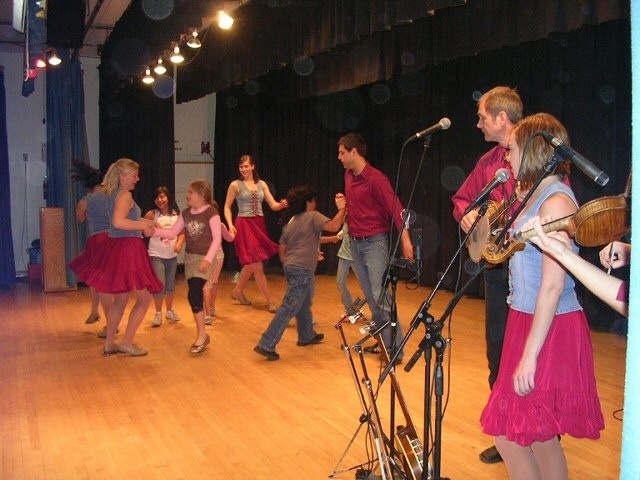 At home and on the road, RIS worked closely with presenters to ensure a lasting impact on each community by offering performances, workshops and residency activities for individuals of all ages, backgrounds and abilities. But WAIT! Before someone jumps to the erroneous conclusion that anyone has retired, rest assured that we are still alive and kicking—doing what we do—however, wherever and whenever we can. As we move into 2011, our lean and mean RIS spinoff group, ShoeFly, is just one example of what we’re talking about. True to our master plan, the final season was rich with the involvement of some of our favorite local partners: the Muse Machine, Carillon Historical Park, Cityfolk, the University of Dayton, Contemporary Dance Theater of Cincinnati, the Springfield Arts Council, and our fourth SuperPops collaboration with the Dayton Philharmonic. Also part of the plan was ending with plenty of performances that were free and open to the public. 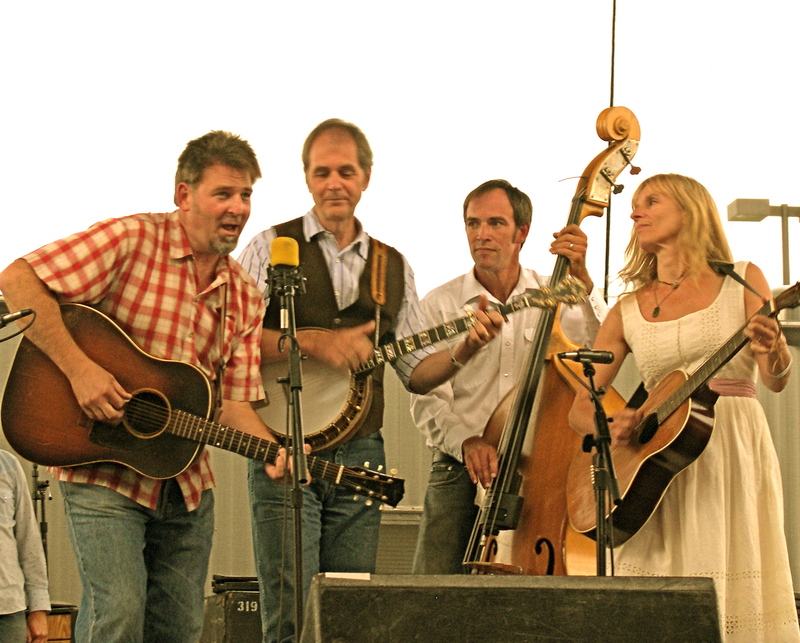 Our last three performances were June 20th at Stubbs Park in Centerville, OH, June 24th at the Springfield Summer Arts Festival and finally, our final performance July 4th, at the Cityfolk Festival. As we planned our final season, were determined to truly celebrate the work we’ve done over the years by recognizing the people we’ve worked with and the community we’ve helped to build. It’s been an incredible run and we want to say thank you for sharing these many great years with us. Rhythm in Shoes has always been about family and community and we are grateful that you’ve been part of it. Our fourth collaboration with conductor, Neal Gittleman and the Dayton Philharmonic Orchestra this May 7th & 8th, at the Schuster Center for the Performing Arts, was a huge success. With two near sell-out houses, the highly emotional and entertaining program featured a memorable live montage of RIS favorites, accompanied by the orchestra playing “Bolero” to the rhythm of Sharon Leahy’s tapping in a tour de force of steadfast focus. Returning for this concert was RIS alumnus, Nate Cooper. Ever the effervescent crowd-pleaser, Nate has been performing for the past few years with Cirque du Soleil in their production of “LOVE” at the Mirage, in Las Vegas. 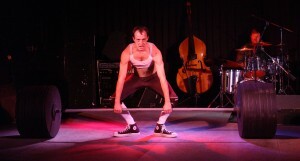 As always, he delighted the audience with non-stop physical mayhem and inspired clowning. Accordionist Kristi Guillory of Lafayette, Louisiana, was on hand to play music she composed for Sharon’s very touching last new work for Rhythm in Shoes. 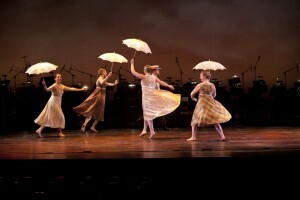 With lush orchestrations by Danny Devellier, also of Lafayette, the piece was visually based on paintings by Jack Vettriano, beautifully realized by John Rensel’s lighting and Laine Marr’s costumes. Guest violinist and fiddler Christina Wheeler who, since her last appearance with RIS, has become a member of the United States Army Orchestra in Washington, D.C., was spectacular playing both the music of Bach and the barn dance. Also making an appearance was Dayton’s own Michael Kenwood Lippert, handily reprising his role as Frank Galileo, the blind private eye from Rick Good’s “Nova Town.” The two selections from the show, orchestrated for the Philharmonic by Ben Cooper and Rick, left those in the audience who had seen the original, full production begging for more. On a personal level, everyone in the Rhythm in Shoes family who was lucky enough to be a part of this production, extends heartfelt thanks and admiration to Neal Gittleman. His open generosity, continuous encouragement, formidable creativity and extraordinary talent helped to make our final theater production all we hoped it would be. Our final collaboration with the Muse Machine, after many years of educational struggles and triumphs together, was a very successful, 50 school run, executed with joy and precision in less than six weeks. 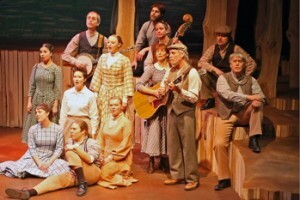 In a tightly constructed historical entertainment called, Brother Can You Spare a Dime?, students learned about the music, dance and culture of the Great Depression and even made some enlightening connections with our country’s current economic crises. Old truths have been relearned, untruths have been unlearned. We have always known that heedless self-interest was bad morals; we know now that it is bad economics… We are beginning to abandon our tolerance of the abuse of power by those who betray for profit the elementary decencies of life… The test of our progress is not whether we add more to the abundance of those who have much; it is whether we provide enough for those who have too little. 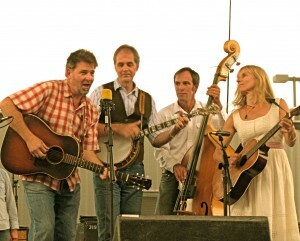 Banjo Dance, our tribute to the music, dance and culture of the Southern Appalachians, enjoyed a good run last November with three shows at the University of Dayton’s Boll Theater, followed by an appearance at the Kent Folk Festival and two nights at the Aronoff Center for the Arts, Jarson-Kaplan Theater, presented by Contemporary Dance Theater in Cincinnati. It was a wonderful variety of venues and the show was well received every night. 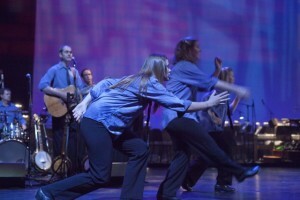 The final performances of Banjo Dance took place on January 30 & 31, 2010 at Ohio Northern University in Ada, Ohio. Our multi-faceted collaboration with the Human Race Theatre Company was a soul-stirring theatrical experience with a stellar cast of players. 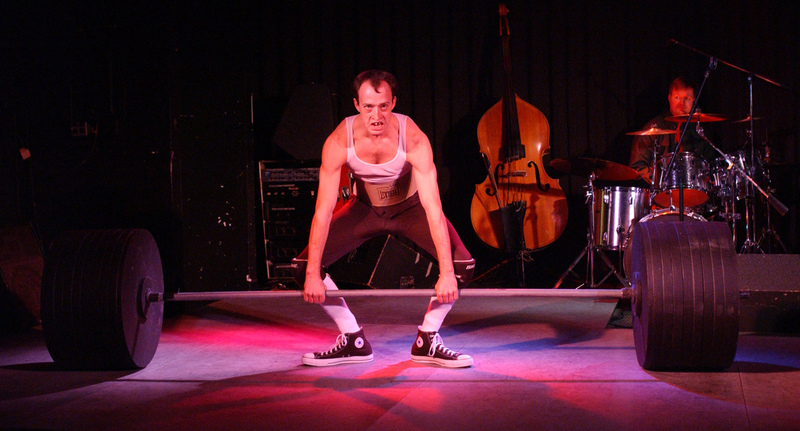 Written by Preston Lane with music and lyrics by Laurelyn Dossett, Brother Wolf was first produced in 2007, at the Triad Theater in North Carolina. Simply stated, Brother Wolf is a retelling of the Beowolf legend set in Appalachia. The Human Race/RIS collaboration at the Loft Theater in Dayton was the ultimate ensemble production with no less than four directors! If this sounds like too many cooks in the kitchen, know that each chef had their specialty. Rick Good directed the music, Sharon Leahy provided the movement, Scott Stoney focused on dialogue and character and Marsha Hanna brought it all together in a feast of delectable theater. Audiences and performers alike are sure to remember the experience as one both inspiring and rewarding. The 10th annual Rhythm in Shoes vaudeville lampoon of the Christmas season was not only our last but, quite possibly, our most successful. For many in the audience it has become a Yuletide Tradition. Presented at Gilly’s nightclub in downtown Dayton, December’s song and dance show, rich in comedy sketches and topical humor, featured familiar favorites like The ADD Duet, The Cowboy Rockettes and Christmas Eve in the Neighborhood Tavern. The latter being populated by a couple of handsome young vampires, Rudolph the Red-Nosed Reindeer and Governor Sarah Palin. 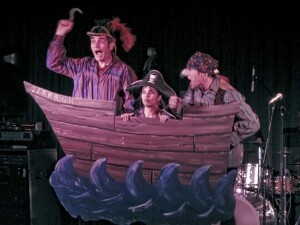 Audiences for all four shows were superb in both quality and quantity and the Company was strong as ever. Particularly entertaining was Tina DeAlderete’s take on Carmen Miranda, performed to Rick Good’s original “Fruity Fruitcake” composition and the Rhythm Pirates Christmas on the Briny Deep (pictured above).